Sayuri Miyamoto dreams of becoming a fighter pilot, and by disguising herself as a man she begins a flight training program at fictional Mitaka Air Base. Later she volunteers to be a kamikaze pilot and sorties on a suicide mission toward Okinawa. 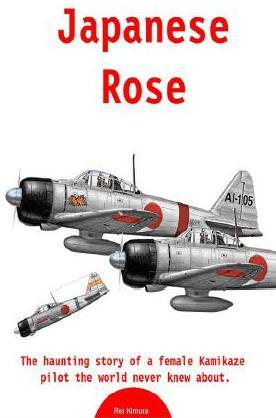 The historical novel Japanese Rose tells the story of this supposedly unknown WWII female kamikaze pilot until finally discovered at the age of 85 by Mayumi Onodera, a persistent female historian who is researching a documentary for NHK TV. The author Rei Kimura, who describes herself as a lawyer with a passion for writing about unique events and personalities, has written about ten electronic books with most of them having Japanese themes. 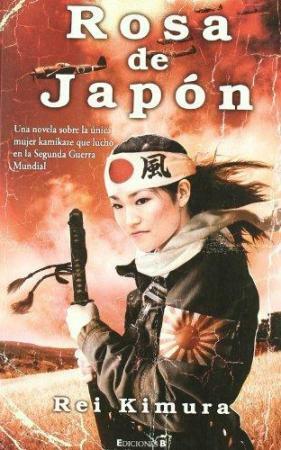 Although this novel's overall storyline and Sayuri's characterization keep one interested in continuing to read, this book contains significant errors and inconsistencies in history, chronology, and geography. More historical research and closer editing would have greatly improved this novel. The story starts with Mayumi Onodera contacting Rika Kobayashi, Sayuri's assumed name since the end of the war, to find out whether she may have been a female pilot during WWII. Sayuri starts her story to the historian in August 1941 at the age of 18 in her family home in Matsumoto. She and her friend Reiko go to Tokyo alone to work at a hospital there in order to be close to Reiko's fiancé Yukio and Sayuri's brother Hiro, who both had been drafted into the Army and stationed at Tokyo-area bases. When Sayuri and Reiko go to an Army registration office, they find out that Yukio has been killed in a recent enemy bombing of Tokyo. Sayuri manages to find her brother Hiro before he gets shipped out to Singapore, but he dies in route when his ship gets torpedoed by an American submarine. Next a bomb strikes the dormitory where Sayuri and Reiko are living. Reiko gets killed, and Sayuri needs four weeks to recover from her injuries. With a burning desire to avenge the deaths of her friend and brother, Sayuri goes to Mitaka Army Air Base to volunteer as a fighter pilot, but she gets informed that military regulations prohibit women from becoming pilots. However, the officer with whom she talks sees her passion to serve her country, so he offers her a base job as a cook. While working as a cook she finds out that the base trains "highly acclaimed kamikaze pilots," so she decides to disguise herself as a man by taking her brother's name Hiro and join in with the next group of kamikaze pilot recruits arriving at the base. Sayuri succeeds in her plan and becomes part of a kamikaze squadron. However, she falls in love with Takushi Yamashita, a kamikaze pilot trainer at Mitaka, and eventually reveals herself to him. They fly together toward Okinawa as lovers in a kamikaze squadron. Takushi's plane succeeds in crashing into a ship, but Sayuri gets intercepted by enemy fighters that shoot her plane down. She survives the crash into the sea, is captured with her capturers quickly recognizing she is a woman, and gets sent to a POW camp on Guam for several weeks. An exchange of POWs leads to Sayuri's return to Japan and her continuing masquerade as a man, but upon her return she gets sent to a place called Shinbu, "known for successfully cleansing many cowards and unpatriotic soldiers." After several months of imprisonment at Shinbu with other failed kamikaze pilots, she finally reveals to a general at Shinbu that she is a woman who has disguised herself as a man to become a kamikaze pilot. Although he is impressed by her patriotic devotion, this whole matter would be very embarrassing to the Army if ever revealed. The Army then arranges for her to be released under the new name of Rika Kobayashi with the stipulation that she never reveal anything about Shinbu and never contact any members of her family. Japanese Rose's chronology contains many inconsistencies and impossibilities. For example, the date of the kamikaze squadron sortie of Sayuri with Takushi Yamashita is in 1945 on March 24 (p. 147), April 24 (p. 6), or at least one week after May 23 (pp. 99-100). Near the beginning of the story Sayuri's family spends time together on the day that the Japanese Navy attacked Pearl Harbor, which happened in December 1941, but then that afternoon Reiko tells Sayuri that she and Yukio have decided to get married in the autumn of 1941. The novel has Tokyo aerial bombardments taking place in late 1942, about two years prior to the actual bombings. The book's internal chronology between Sayuri's kamikaze squadron sortie and her release from Shinbu makes no sense. The novel gives her sortie date as somewhere between late March and late May 1945. She spends weeks in a Guam POW camp (p. 123) and then a few months at Shinbu (p. 138), but she gets released from Shinbu inexplicably in early June 1945, two months prior to atomic bombs being dropped on Hiroshima and Nagasaki. Geographical locations also present a source of confusion throughout the book. As an example, Sayuri watches at an air base in mainland Japan as "6 kamikaze planes took off loaded with explosives to be flown into identified targets in the waters near Hawaii" (p. 98) even though such a flight would not have been possible with WWII aircraft and even though Japanese warplanes never got close to Hawaii during the last year of the war. Sayuri lived her childhood in Matsumoto, which the book says had only two thousand inhabitants (p. 32) even though Matsumoto had a population of about 75 thousand during WWII. Sayuri's kamikaze squadron reaches Okinawa from mainland Japan in about one hour (pp. 110-1), but the fastest Japanese WWII aircraft could not have made the flight this quickly. Generally the locations of geographical places mentioned in the novel, such as Mitaka Air Base and Shinbu, remain rather vague with no mention of even the prefecture in which they are located. The historical background concerning kamikaze pilots as presented in Japanese Rose does not reflect actual history. Real kamikaze pilots, in contrast to those portrayed in the novel, did not just volunteer, get sent to a special air base such as Mitaka, and then start training for suicide attacks. Young men in the Navy and Army went through rigorous basic training and flight training prior to being considered for assignment to a kamikaze squadron. The book mentions that General Ugaki devised these special attack units of kamikaze pilots (p.69), but actually Vice Admiral Takijiro Ohnishi created the special attack units of kamikaze pilots in the Philippines in October 1944. Matome Ugaki, who led kamikaze attacks during the Battle of Okinawa, was a Vice Admiral in the Navy, not a General in the Army. The name Shinbu is used as the name of the place where failed kamikaze pilots were sent, but actually Shinbu (meaning "military might") was the name used for most of the Army's special attack squadrons that sortied from the Japanese mainland during the Battle of Okinawa. However, Shinbu Barracks in Fukuoka did exist as a secret place where certain failed Army special attack pilots were interned until the end of the war. Despite the novel's inaccuracies and unlikely storyline that at certain points becomes unbelievable, the imaginative plot with a female kamikaze pilot should keep most readers interested and make them ponder what it would have been like to have pulled off such an huge deception.